Are you looking for a great way to promote your Syracuse, NY business or organization? One of the easiest ways to let your clients know who you are and where you’re located is with custom made signs. Seaboard Graphics knows that our customers want to look their professional best, and one of the many ways we can do that is by helping you get the sign you need to make your business or organization more visible. No matter what kind of sign you need – storefront, window, tradeshow or vehicle – we provide clean, sharp images and amazing results. You’ll like our many different options that will help you get recognized. By choosing Seaboard Graphics for signs for your Syracuse, NY business or organization, you’re choosing a company of professionals who make it their mission to help you look your best. We’ll help you every step of the way – if you need help designing your sign, our graphic designers have what it takes to help. Maybe you already have created the design you want – using state-of-the-art equipment, our skilled printing staff will make sure you get the best possible sign to help your business or organization stand out. To make your Syracuse, NY business stand out, choose signs from Seaboard Graphics. 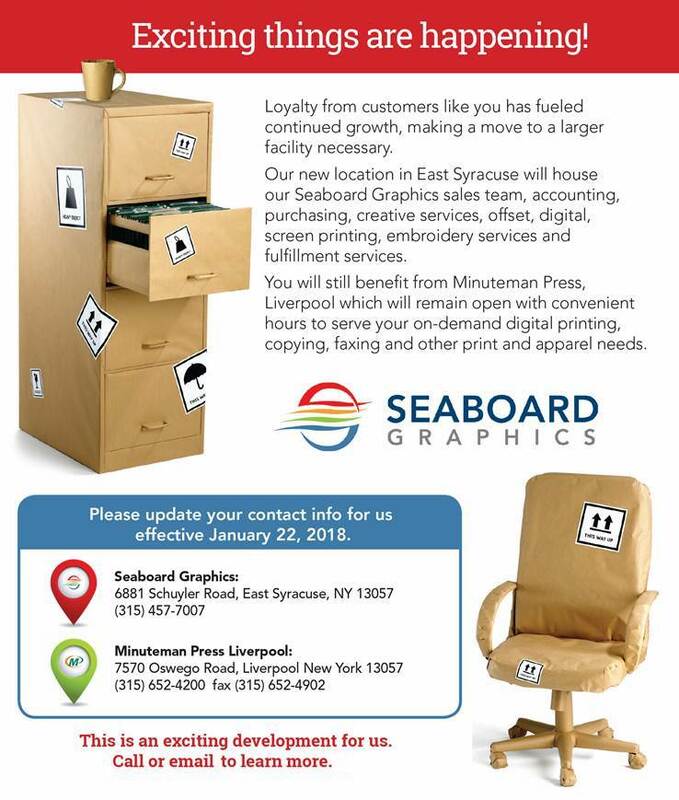 If you have a totally unique idea for signs for your Syracuse, NY business or organization, you can count on Seaboard Graphics to help as well. We’re able to meet your needs by providing the best selection of custom sign solutions, and we have the best printing equipment available. Couple that with a staff that has more than 65 years combined in the printing business, and you’ll quickly discover that you can get the very best quality signs at a price that you’ll like, too. When you need signs for your Syracuse, NY business or organization, the professionals at Seaboard Graphics are ready to help. To learn more about our custom-printed sign solutions, call us at 800-721-1663 or fill out this convenient online contact form, and we’ll be happy to help with your sign needs and more.